Fits 32” to 50” Screens, Up to 99 lbs. 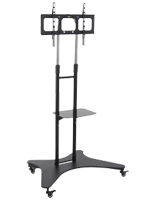 This flat panel cart, a mobile TV stand that can support a television measuring 32”-50” weighing up to 99lbs is constructed of steel for durability and long lasting use. 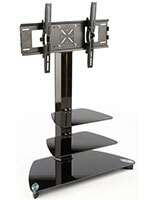 Each portable caddy features an adjustable bracket with three height settings for ideal viewing. 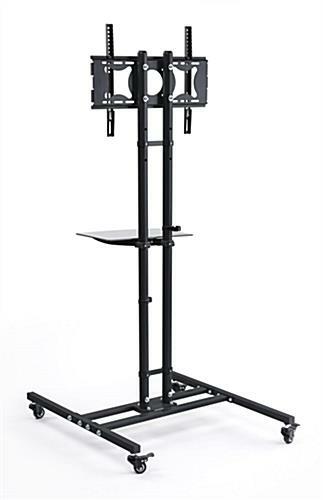 This black mobile TV stand has an adjustable height shelf ideal for small AV devices including DVD players, Blu-ray players, and other items. This shelf is constructed of dark tempered glass which is more durable than traditional glass and is less likely to break or scratch. Each rolling mobile TV stand provides a great way to transport a mid-sized television in a professional setting. 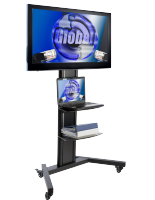 This flat panel cart can be used in a school or office where it is necessary to share audio visual devices and is ideal for presentation use. 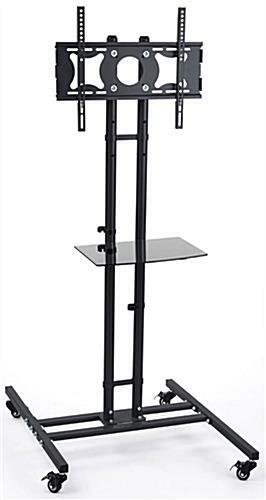 Business professionals and school administrators use this mobile TV stand that has an accessories shelf constructed of tempered glass because of its professional appearance and ease of use. 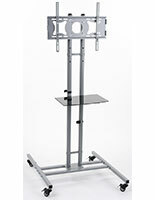 Accentuate any professional setting with this LCD cart! 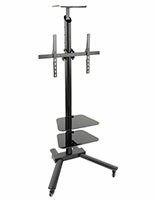 The mobile TV stand, such as the flat panel office furniture is an important and beneficial presentation tool. 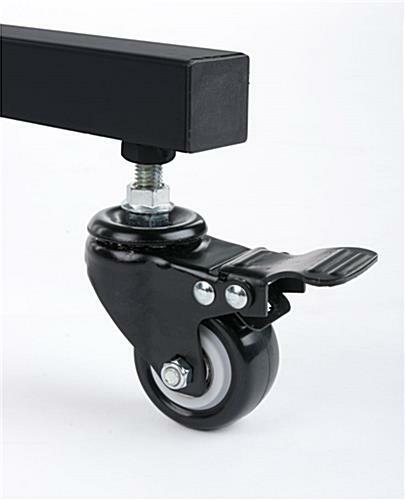 Each portable cart has (4) heavy duty lockable wheels, which are more durable than traditional plastic wheels. 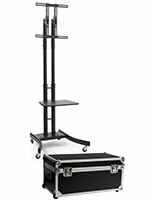 The steel wheels increase the portability of the mobile TV stand and ensure smooth gliding over most floor surfaces. 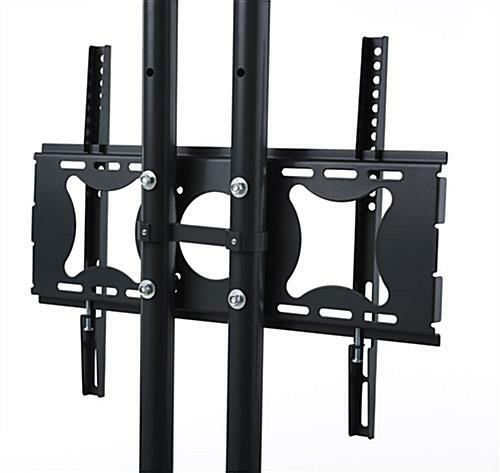 The locking capability provides stability to the flat panel television furniture when in the stationary position. 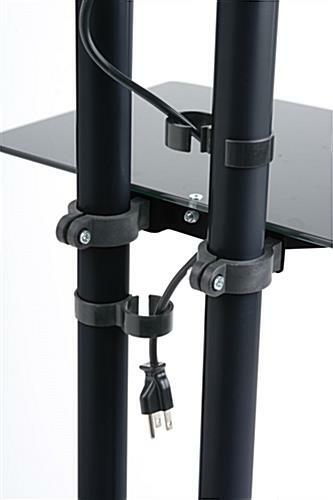 Each mobile TV stand that has heavy duty rolling casters also has built in cable management brackets to keep wires neat and tidy for a professional appearance. 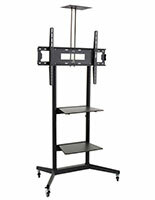 Use this LCD cart for presentations and conferences in a small to midsize conference room or classroom. 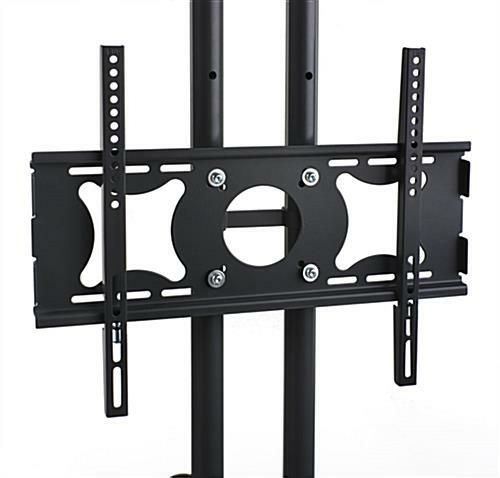 Please Note: This mobile TV stand is VESA compatible. Please see specifications for compatible VESA sizes. 28.3" x 62.0" x 32.5"
17.0" x 21.5" x 8.0" x 0.75"
very pleased with our purchase!